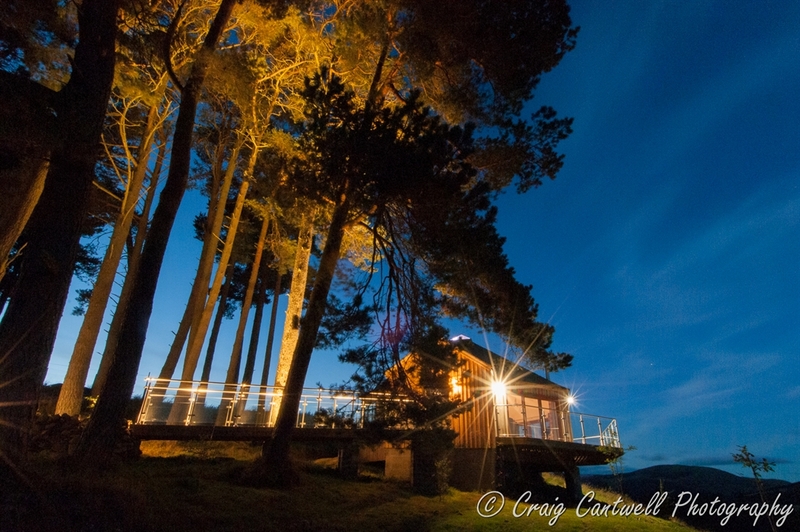 The Scots Pine Treehouse is one of two luxury treehouses at Dalnoid. Designed specifically for couples to relax and enjoy themselves, these architect-designed 'octagonal' treehouses are each set in their own secluded hillside position, with fantastic panoramic mountain views, private hot tubs and wood-burning stoves. The treehouse is situated on the edge of the Cairngorms National Park, surrounded by stunning mountains, forests and moorland. Located 20 minutes drive from the Glenshee Ski Centre. The Scots Pine Treehouse is accessed via a secret archway and bridge through the trees. The interior consists of a large open space with a super king-size bed under a pyramid roof-light, a wood burning stove, lounge area with Freeview TV and DVD, dining area and fully equipped kitchen - all with stunning mountain views through the large windows. The separate luxury bathroom has a freestanding bath, walk-in rainfall shower and hillside views. Outside is a decked area with a hot tub looking out towards the mountains. Wifi, bedding, towels and bathrobes provided. Sorry no children or pets.